Among government officials, urban planners, and development workers, Africa's burgeoning metropolises are frequently understood as failed cities, unable to provide even basic services. Whatever resourcefulness does exist is regarded as only temporary compensation for fundamental failure. 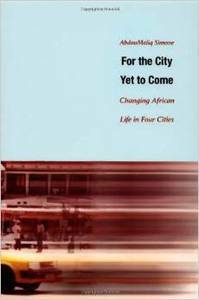 In For the City Yet to Come, AbdouMaliq Simone argues that this perspective overlooks all that does work in the Africa's cities, thereby foreclosing opportunities to capitalize on existing informal economies and structures in development efforts within Africa and to apply lessons drawn from them to rapidly growing urban areas around the world. Simone contends that Africa's cities do work on some level and to the extent that they do, they function largely through fluid, makeshift collective actions running parallel to proliferating decentralized local authorities, small-scale enterprises, and community associations. Drawing on his nearly fifteen years of work in African cities-as an activist, ngo and local government advisor, teacher, development worker, and researcher-Simone provides a series of case studies illuminating the provisional networks through which most of Africa's urban dwellers procure basic goods and services. He examines informal economies and social networks in Pikine, a large suburb of Dakar, Senegal; in Winterveld, a neighbourhood on the edge of Pretoria, South Africa; in Douala, Cameroon; and among Africans seeking work in Jeddah, Saudi Arabia. He contextualizes these particular cases through an analysis of the broad social, economic, and historical conditions that created present-day urban Africa. For the City Yet to Come is a powerful argument that any serious attempt to reinvent urban centres must acknowledge the particular history of African cities and incorporate the local knowledge reflected in already existing informal urban economic and social systems.